I just got home from a road trip earlier tonight, and am in the process of unpacking and catching up on laundry …. but wanted to let everyone know that I am home now, and will try and catch up on my e-mails, Facebook messages etc. over the next few days. I did have a laptop with me on the road, but since I was on holidays, kept the computer stuff to an absolute bare minimum. Thanks so much to those of you who kept in touch while I was away – it was awesome to hear from you ! I’ve been away for 8 days, and we had a great time, especially considering the trip was rather last – minute. I have a couple of thousand pictures to sort through, but I will pick some of the ones I like best, and post them with another blog post soon, talking about our trip, where we went, what we saw and did etc. I think I’ll be heading to bed early tonight, but I’ll write more soon. 1997 was a very interesting year for me : it was the year I left Ontario for the last time, and moved back to B.C. to start a new life. I lived in White Rock for a while, and met some really great people there, both through work, and other activities. I started taking Acting Classes at the Peace Arch Performing Arts Academy – led by Scott Wheeler, President of White Rock Players Club, at the time. ( years later, he would be M.C. at both my wedding, and my own CD Release Party ) He became a very good friend, and introduced me to many people in community theatre, and music. One of those people was Alex Browne – Peace Arch News’ fabulous Arts and Entertainment reporter and writer, who also ended up becoming a good friend. He had a 1920’s – 30’s Band, and actually gave me my first opportunity to sing a couple of numbers at a real gig of his. 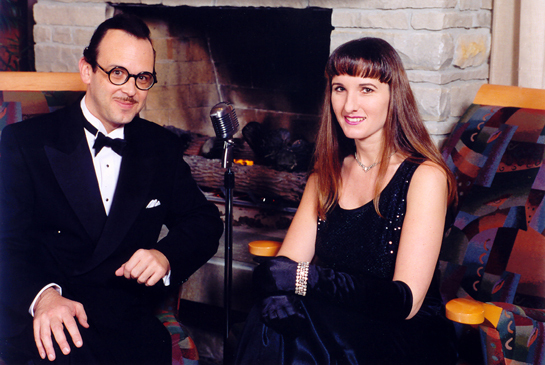 I remember it well – ” Vintage Affair 1997 ” at Morgan Creek Golf Course. I sang ” Someone To Watch Over Me ” , and ” It Don’t Mean A Thing ( If It Ain’t Got That Swing) “. I was thrilled to be able to sing with such a talented band, and bandleader. 1997 was also the year we all started going to Babalu, and met Michael Bublé and his family for the first time. We spent so many nights dancing to his wonderful voice ! It was so amazing to find a place to be able to dress up, and be around so many classy, elegant people, who were all there for the same reason – to appreciate Michael’s talent, and to hear really great music. It was never a problem finding a dancing partner. Michael was performing in ” Red Rock Diner ” that year, so we saw him on Sept. 27th at the Arts Club Theatre, then again on Hallowe’en, at Surrey Arts Centre. As usual, a good time was had by all. The year ended on a high note – Scott, Alex and I, as well as some of our other close friends, rented a limo, and went to Vancouver, to spend New Year’s Eve at Babalu, with Michael Bublé performing. That was a fantastic night ! 1997 was definitely a good year for me – a fresh start, meeting new people, and being able to sing, dance and act all the time. What more could a girl ask for ?